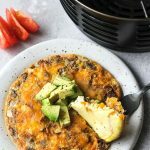 Healthy breakfast frittata recipe made in your air fryer- what could be easier! 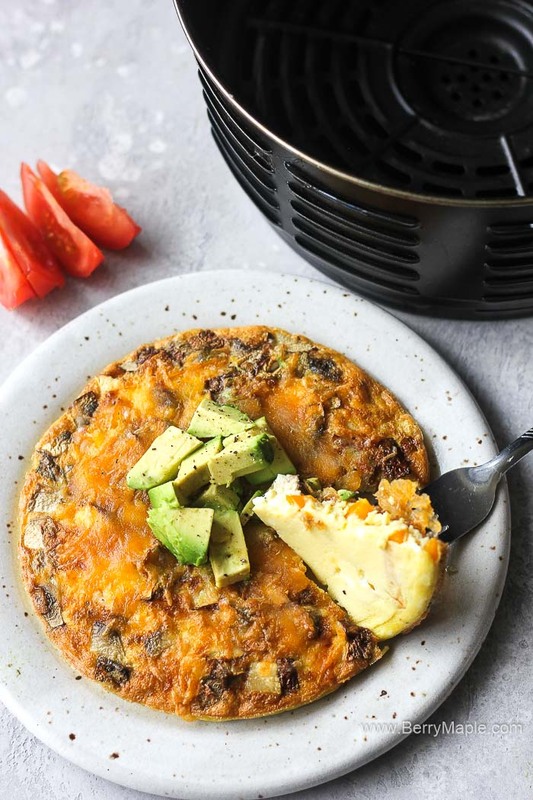 Low carb egg dish served in less then 10 minutes. 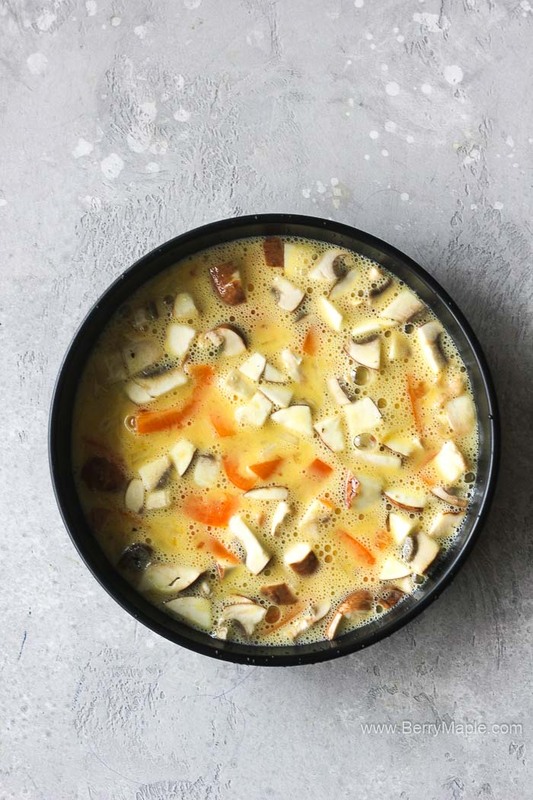 This omelette frittata is vegetarian, gluten free, keto and weight watchers friendly. 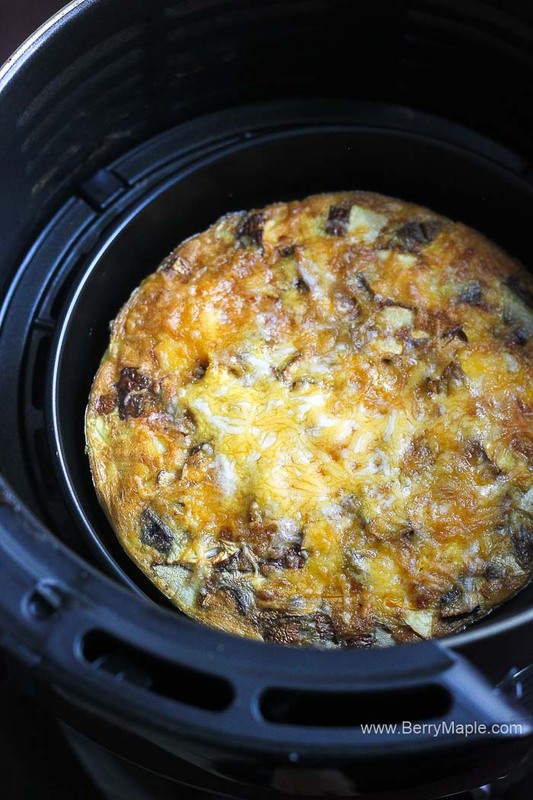 I never thought of making eggs in the air fryer before until this moment. Who knew it will be so easy and time saving! I recently ordered an air fryer accessory kit ( the cheapest one:) and decided to try those pans out. I chose to make a vegetarian one, because in lighter in calories and honeslty, thats just what i had in the fridge at that moment. Best eat this egg dish while its warm. You can double the amount of cheese if you feel like it. Next time i will add some zucchinis and maybe tomatoes, why not! 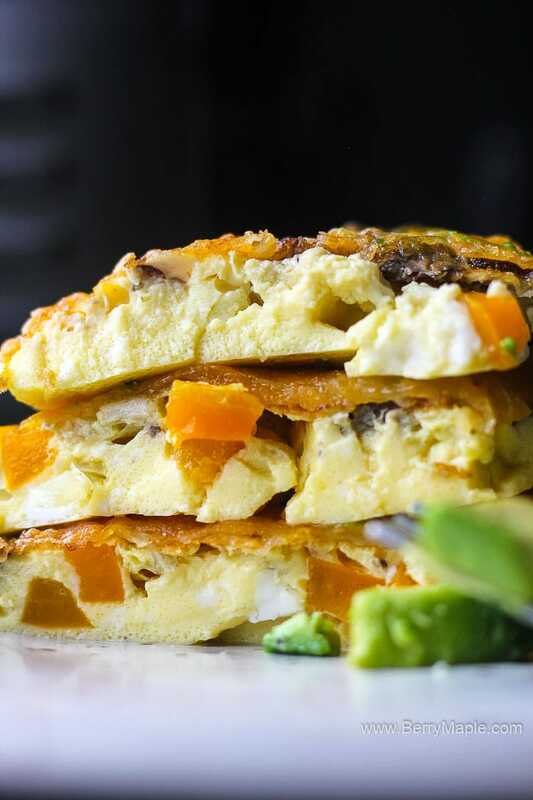 Also cant wait to try an all meat frittata, it should be fun! 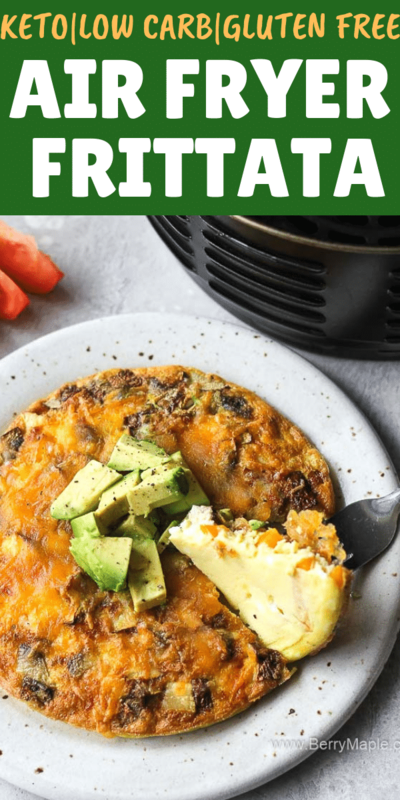 If you are an air fryer fan just like me, try these cool recipes, i promise, you will love em: Air fryer beef steak kabobs, Air Fryer fish and chips or Air fryer bacon wrapped jalapeno poppers. Whisk eggs with cream. Add salt and pepper. Add veggies. Preheat air fryer to 400 degrees. Pour the mixture to the pan and place that put into the air fryer. Cook for 5 minutes. Add shredded cheese and then cook for another 1 minute. Carefully remove the pan from the air fryer ( i used a towel) and serve with avocado, tomatoes and bread if desired. Enjoy. Hello and Welcome to Berry&Maple! My name is Tatiana, nice to meet you. 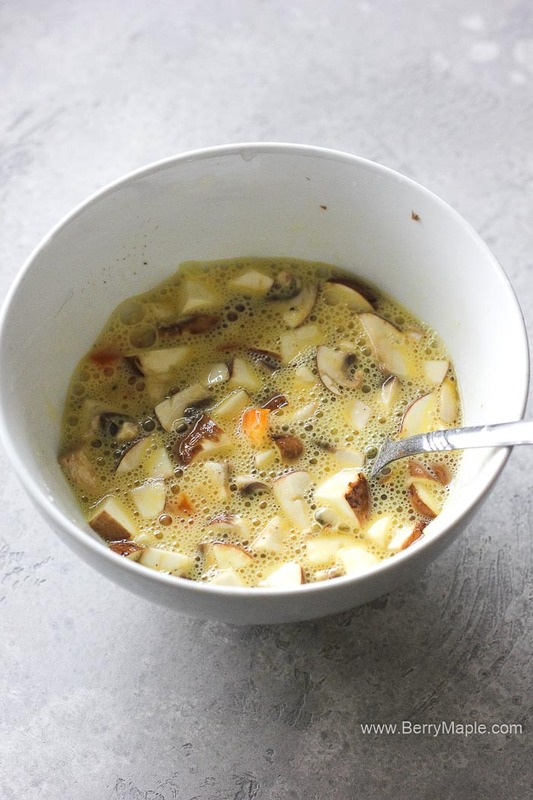 Enjoy easy family recipes here with me and my kids! Berry&Maple is a participant in the Amazon Services LLC Associates Program, an affiliate advertising program designed to provide a means for sites to earn advertising fees by advertising and linking to amazon.com for products I highly recommend (as well as other affiliate companies). If you purchase any item from Amazon by clicking to their site via the affiliate link, it will cost the same to you, but I will receive a small commission. Your purchase helps support Berry&Maple and is much appreciated!